The IHF says many users mistakenly believe that it is not addictive. Furthermore, it exposes users to more carbon monoxide in addition to nicotine which is highly addictive. Use of these water pipes can affect heart rate blood pressure regulation and users are at increased risk of cardiovascular disease, respiratory disease, cancer and other tobacco-related diseases. Last week, the American Heart Association issued a similar warning against the smoking of tobacco in hookahs. The AHA said that even though direct comparisons between hookahs and cigarettes have some limitations, “a single session of hookah use typically results in greater exposure to carbon monoxide than a single cigarette”. The AHA added there is a misconception in the US that hookah smoking is less harmful than cigarettes because the tobacco is filtered through water, a claim it says has no scientific evidence. 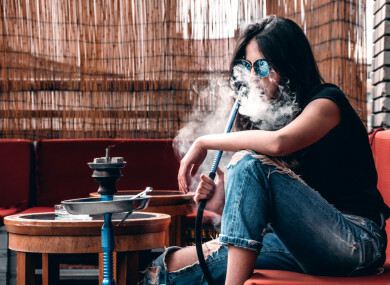 Because most people smoke hookah in lounges and cafes it is perceived as a social activity and less habit-forming, AHA research found. In a statement to TheJournal.ie, the HSE said that hookah/shisha is regulated in line with other tobacco products. The Environmental Health Service oversees the enforcement of Tobacco Control Legislation. This legislation lays down the legal requirements in relation to tobacco products including shisha pipe tobacco. Under the Tobacco Control Legislation, all tobacco products – including shisha- on sale in Ireland should be compliant with the appropriate health warnings and correct labelling of the product. The legislation also imposes restrictions on areas used for smoking hookahs in accordance with smoke-free requirements. Despite hookah/shisha being regulated in line with other tobacco products, the HSE has no warnings against it or information about it online. Globally, hookah usage is spreading among younger people. Data from a survey of seven Middle Eastern countries showed that the rates of hookah smoking ranged from 9% to 15%. Hookah is available in a number of cafes and lounges around Ireland, however, little research has been carried out on its popularity here. Dr Doorley of the IHF acknowledged this lack of research but said “while we do not have reliable data on the extent of the use of water pipes in Ireland, we would strongly advise against their use”. The Environmental Health Service has said it deals with the non-compliance of tobacco products – such as hookah - as a matter of priority. Anyone can report details of noncompliance by contacting the Office of Tobacco Control on 1890 333 100. Email “Irish Heart Foundation 'strongly' advises against use of hookah pipes due to carbon monoxide levels”. Feedback on “Irish Heart Foundation 'strongly' advises against use of hookah pipes due to carbon monoxide levels”.